commonly called Tay-Sachs disease, was one of the first identified lysosomal storage diseases. Onset Tay Sachs (LOTS), typically develops mild ataxia and dysarthria by early teenage years. Tay Sachs disease is caused by the excessive storage of GM2 gangliosides in lysosomes. ganglioside is shown in figure 3 and the corresponding ball-and-stick model is shown in figure 4. 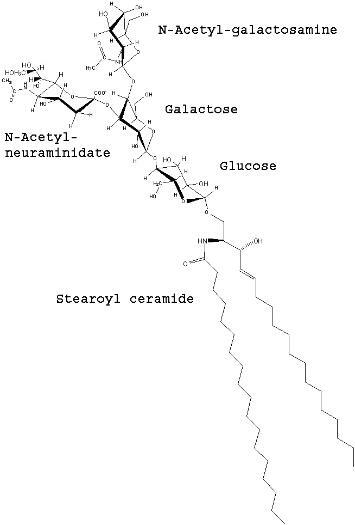 Shown in both of these figures is the stearoyl fatty acid form of ceramide. Figure 3. Structure of GM2 Ganglioside. Figure 4. Model of GM2 Ganglioside. clinical risks of excessive reduction in synthesis are related to the function of these molecules. 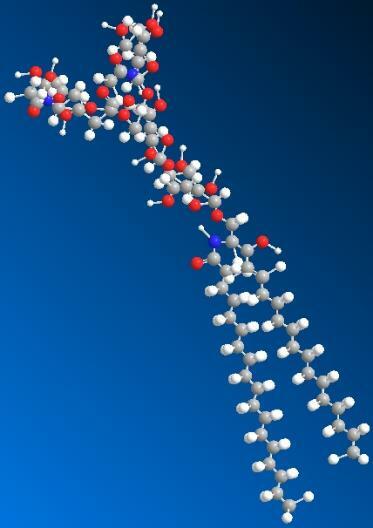 Encyclopedia of Genes and Genomes web-site, http://www.genome.ad. manifest the infantile form. GM2 Gangliosidosis is inherited in an autosomal recessive manner. which are intended to marginally increase enzyme activity levels above this critical activity level. adequately dock with the Hex A heterodimer leaving the substrate to accumulate in the lysosome. Figure 5. The proposed catalytic mechanism for GM2 ganglioside being converted to GM3 ganglioside is shown.